Pitfall: The Mayan Adventure is an action-platformer that was released on various systems including the Sega Genesis (1994). As Harry Jr. your quest is to rescue your father from Zakelua: Lord of Evil, and discover the lost treasure of Uaxactun. Your main weapon is a sling that can be used as a whip or a stone thrower, and it can also be charged for a Super Shot by holding down the A button. Boomerangs and Exploding Stones (that clear everything on screen) can also be collected throughout your adventure. The gameplay usually consists of fighting enemies, climbing ropes, swinging on vines to cross gaps and riding ziplines; while this sounds like the pedigree for a great action-platformer, the game has many flaws. For starters, the level design is atrocious and generally consists of unintuitive labyrinths that make exploration a chore. There's also too many instances where enemies are placed directly in front of you after climbing a rope or disengaging from a zipwire, leaving you no time before taking damage. On a related note, I often found myself being hit due to a very slight, but noticeable delay when pressing the attack button. 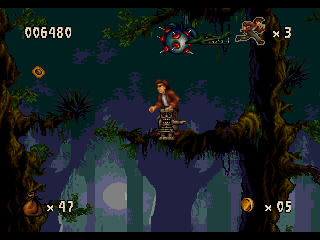 Another peeve is the life metre, as instead of a simple health bar the developers tried to be cute by including a graphic of a crocodile next to Harry Jr.; the closer it is, the closer you are to death, but it's not easily distinguishable at a glance. The graphics have had a nice upgrade from the 16-bit versions, but the downside is this port only runs at 30 frames-per-second instead of 60; this results in choppy gameplay and instances where you'll mistime jumps. To give the game credit, the animation is superb and the way Harry Jr. swings from side-to-side when climbing ropes is impressive. Pitfall: The Mayan Adventure is graphically impressive, but that doesn't make up for the poor level design, delayed controls and godawful frame-rate. Even though the core gameplay is mediocre on the Sega Genesis, you're much better off playing that version, as at least it runs at 60 frames-per-second to ease some frustration!